Ben has been going through a toy gun phase in recent months, spending all of his allowance money on plastic weaponry from the Dollar Store. He asked me to make him a wooden AK-47 on his birthday, which turned out not too bad. As Dad watched Ben run around the house with his cache of guns, spending a couple of days in Fort McMurray while we were in NYC, he was reminded of a kind gentleman that made him a wooden pistol when he was little. "His name was Julius Liepert," he shared. 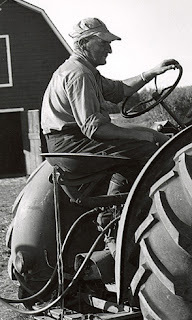 "He was a hired hand at the farm, changing over some of the equipment to hydraulics. He took the time to make me a wooden pistol. It was great, and he was such a nice man." This was over 70 years ago, probably in the early 1940s on the family farm near Stornoway, Saskatchewan maybe 30 kilometres southwest of Kamsack. "He was tragically killed in a farming accident, crushed I think," he said. "I wonder if he was related to Ron Liepert, Alberta's Minister of Energy," I asked. "He's originally from the Saltcoats area." "Saltcoats? That's where Julius was from." I had met the honourable Minister on a number of occasions but didn't have his email handy, so I looked it up on the government website. I sent off a note and had a reply the following day. Sure enough, he had an Uncle Julius, his dad's closest brother, who was crushed by a tractor that slipped out of gear and pinned him up against a wall. It's a small world and I'm always surprised at the random examples of extreme connectivity. I sat down on the edge of Ben's bed last night and told him this story, marveling at the impression this kind man made on my father all those years ago. Seventy years later, the kindness of one man, whose life was cut way too short, still resonates. I think that's something to celebrate.